Invitation & Registration Details: Register before May 3, 2013 for early registration prices of $90/$70/$40 Member/Companion/Child, otherwise add $10 per member/companion at the door. A pair of Okotokians slid its way into international acclaim with a podium finish at the world’s marquee Juvenile curling event. Team Alberta, featuring Okotoks’ Kyler Kleibrink and Christian Sprinkhuysen, brought home the bronze medal at the Optimist International U18 Curling Championships, March 31 in Surrey/Langley B.C. The Alberta curlers had a dream start to the event by picking up three straight victories over Pennsylvania, Prince Edward Island and Minnesota to take a stranglehold on playoff positioning in Pool B. Team Alberta, composed of Nanton-skip Jeremy Harty, Kleibrink at third, Brooks’ Jeremy Burnett at second and Sprinkhuysen at lead, hit its first road-block in a 7-6 loss in an extra end to Ontario on March 30. They would recover from the opening loss quickly, picking up a convincing 6-0 win over Quebec in the round-robin finale. With a record of 4-1, Team Alberta advanced to a semifinal showdown with Manitoba, an undefeated rink heading into the contest and eventual gold medalists. Manitoba grabbed an early 5-0 lead through three ends, and despite a valiant comeback the Alberta curlers simply ran out of rocks and lost 7-4. A chance at redemption came in the form of a bronze medal game draw against Team Japan, where the Alberta curlers edged their opponents by the narrowest of margins in a 4-3 thriller. The bronze medal from the 12-team tournament was not a bad way to cap off a Juvenile career for the curling foursome, who will now move up to the Junior ranks. When it comes to convenience, a lot of cities talk the talk, but they just can’t walk the walk. Well in Cincinnati USA, you can walk just about everywhere. In fact, Prevention Magazine recently ranked Cincinnati as one of the Top 10 Most Walkable Cities in the United States. 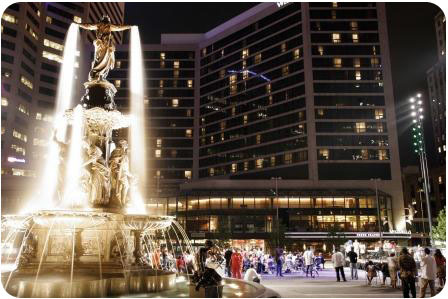 There are countless restaurants, clubs, music venues and shopping stores within a two-minute walk from your hotel and Fountain Square. This compact, easy-to-navigate footprint lets attendees readily explore the city and find their inner energy before, between and after events. For Members who prefer to print off a form to submit by mail or fax. To download the registration form, click here. Look who's registered for Cincinnati! Before you book your travel and housing, please consider arriving early or staying late to experience everything that Cincinnati and Northern Kentucky have to offer. You may want to catch a Cincinnati Reds baseball game, visit the Cincinnati Zoo & Botanical Garden, discover the wonders of an underwater world at the Newport Aquarium, tour the National Underground Railroad Freedom Center or experience the thrill of Kings Island Amusement & Waterpark. Your International Convention Committee is also working hard to coordinate a Saturday Charity Chili Cook-Off/Tailgate Party. For more information check out the link below, to O.I. website on the convention. 2 teams that represented Saskatchewan at the 2013 Optimist International U-18 Curling Championship in Surrey and Langley BC. Combined gender Zone, Regional and District contests must have no fewer than three participants. Separate gender Zone, Regional and District contests must have no less than six participants (three boys and three girls). A. Send winners directly to the next level of the contest. If your Zone or Regional competition has at least 3 contestants of one gender, you can hold the contest for that gender and send the winner on to the next level. Again, if there are less than 3 contestants for either gender, please forward them to the next level of competition. " a)The District shall conduct both a boys and girls’ Oratorical Contest each year. The District Finals will be held at the time of the Third Quarter District Conference. b) Pursuant to the policies of Optimist International all phases of the District Contests shall be conducted in strict compliance with the International Contest rules. judges, etc. and other details pertinent to the conduct of the contests. Lieutenant Governors in that region. responsibility of the sponsoring Clubs. shall be the responsibility of the District Administration. Topic: "Why My Voice is Important"
Our District hold Regional Events before the District Contest for each Province or State such as: Alberta, Saskatchewan, Montana, and Northern Wyoming. "Lillis Center on the St. John's Lutheran Ministries Campus"
Look for the building with a cross on the top (chapel). We will be on the lower level (use the lower parking Lot). The District deadline to submit winners to Optimist International is June 15, 2013. Optimist International does not set Club/Zone/Regional deadlines. For an application with contest rules, click here. All Members can now view and conveniently print planning pages for any International Program from your home computer. Click here to view the 2012-2013 Club Oratorical Contest Planning Guide. Click here to view the 2012-2013 District Oratorical Contest Planning Pages. Click here for information about the Kids Speak Out contest. To view the planning pages for any of the International Programs and Community Activities, please visit the forms and publications page. Oratorical Contest Package - A Program Package for the contest is available by clicking here. Clubs can find useful materials to help them get started with the scholarship contest. Support merchandise for this program can be ordered through Optimist Supply for US and Caribbean Clubs and from OptiPromo for Canadian Clubs. Contact information for both supply companies can be found here. For additional information, please contact the Optimist International Programs Department by e-mail at programs@optimist.org, or call (800) 500-8130. If your Club or District is sponsoring a contest, certificates of participation can be presented to all contestants. Optimist International has developed a series of news releases that Clubs and Districts can use in connection with their participation in international programs. Below are sample news releases that Clubs and Districts can use to promote the Oratorical Contest. Please note that the .doc version enables users to type their information into fields*, while the .pdf files are for viewing only. Has your club started preparations for running a local Oratorical Contest? Why not? Please consider running a club competition and sponsoring a winner to compete in the Zone, Regional and District Speak-offs. Club Speak-off: This is the entry level contest were one or several clubs will conduct a community-level speak-off contest to select one male and female finalist per club to compete at a Zone speak-off. Zone Speak-off: The club finalists will compete in a multi-community competition to select a male and female finalist to move forward to compete in a Regional speak-off. Regional Speak-off: The zone finalists will compete in a province or state level competition to select a male and female finalist to move forward to compete in the District speak-off. District Speak-off: The District Speak-off between the Regional finalists will be held in Calgary, Alberta during the 3rd Quarter District Conference in Billings, MT during the 17-18 May 2013 weekend. How: Contact Shirley Green (the District Oratorical Competition Chair) for more details. Clubs can find all of the details, instructions, forms and planning guides on the Optimist International Oratorical Contest webpage.